OnSpain is a renowned Spanish language school in Malaga accredited by the Cervantes Institute. OnSpain offers a wide range of Spanish Courses in Malaga with a maximum of 8 students per class. As a result, students receive expert attention from their instructors and form a close-knit bond with classmates. This school also organizes extracurricular activities and daily excursions so students can practice their skills in a real-world setting. Onspain teaching methods emphasize the Spanish culture using a dynamic and immersive curriculum. 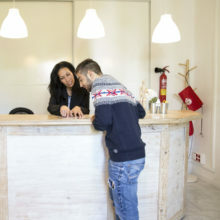 OnSpain has 18 airy classrooms in two elegant buildings. The first building stands in Malaga's city center and the other is located a few meters away from the beach. 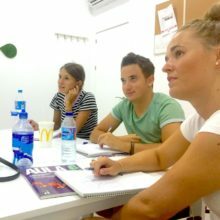 Due to its beautiful location and cutting-edge academics, OnSpain is one of the best language schools to study Spanish in Malaga. Medium intensity means you'll have enough time to enjoy life in Spain while taking Spanish courses in Malaga. Onspain teachers allow you to learn Spanish quickly due to a mix of hands-on experience and classroom practice. OnSpain offers a special program for families who want to study Spanish in Malaga while enjoying a holiday in Spain. Adults can take intensive Spanish lessons or just relax while their children learn Spanish. 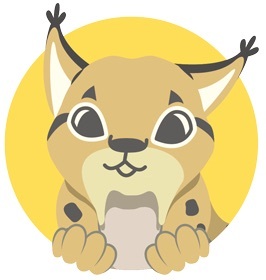 Children are placed in a variety of possible levels depending on age and ability. Additionally, families are always accommodated in the same house. Malaga is the perfect location to learn Spanish in Spain. This city offers a modern Mediterranean lifestyle and more than 300 days of sun per year. The cost of living in Malaga is also very affordable and locals are very friendly. Also, Malaga boasts two thousand years of culture with many beautiful historic sights. The Onspain Spanish language school in Malaga has two different buildings. One of them is an amazing villa with a large Andalusian patio located close to Malaga's beach. Onspain has two buildings in Malaga. This one located in the city's Soho neighborhood, surrounded by museums and shops. The city center also offers amazing tourist sites, including the Marina square, the Alcazaba, or Gibralfaro. The General Spanish Course consists of 20 lessons per week of 55 minutes each to study Spanish in Malaga. All new OnSpain students take an oral and written placements test on the first day of class. Students are then grouped by ability according to the test results. The classes have a multicultural atmosphere with an average of eight students per group. A normal day at OnSpain is divided into two different sessions, and each lasts 1 hour and 50 minutes with a 20-minute break in between. In this break, you can practice all the Spanish you've learned and socialize with your classmates. The school usually starts every Monday of the year. For beginner levels (A1 and A2) the course starts every first Monday of the month. This program is specifically designed for families who want to enjoy another kind of vacation in Spain. Your family will have the opportunity to learn Spanish in Malaga while attending the same Spanish language school. We offer many different academic plans. Ask us about them! OnSpain will provide you an internship with a company in greater Malaga area. This program combines Spanish intensive coursework with an internship at a Spanish-speaking company. This course is for professionals looking to improve their Spanish for career purposes. In this course, OnSpain will focus on all skills, including listening, speaking, reading, and writing. This course’s content prepares students for their official certificate of “Spanish for Business” given by the Chamber of Commerce in Malaga. OnSpain organizes plenty of activities such as an exchange with Spaniards, tapas tour, and sports activities. The school also organizes trips to Seville, Granada, Ronda, Cordoba, and much more! Note: The total costs above include classes, placement test, use of school facilities and free internet (Wi-Fi). The grammar book is not included in the price and it costs 25€.